I like my fruit under ripe. Like really under ripe. I want my fruit to have a crunch. In fact, nothing grosses me out more than mushy fruit. Blech. The worst offender is the banana. A mushy banana is one food I will not eat. I would venture to say that I would rather go hungry that eat a mushy banana. It gives me the heeby jeebies. Seriously. I also have a husband who has the irrational fear of not having bananas in the house. Every time he goes to the store he buys bananas. I usually freeze half of them for smoothies but this past week I was off my game. I let the banana situation get a little out of control. We had some seriously brown bananas on our counter. That was enough to make me a little squeamish. I should also tell you I am not baker. I don’t like it. I would rather just throw a bunch of stuff into a pot and call it a day. That baking thing requires measuring and sifting and mixing. All of that? Not my thing. So let’s review. I hate mushy bananas. I had an abundance of them. Annnnd I don’t bake. 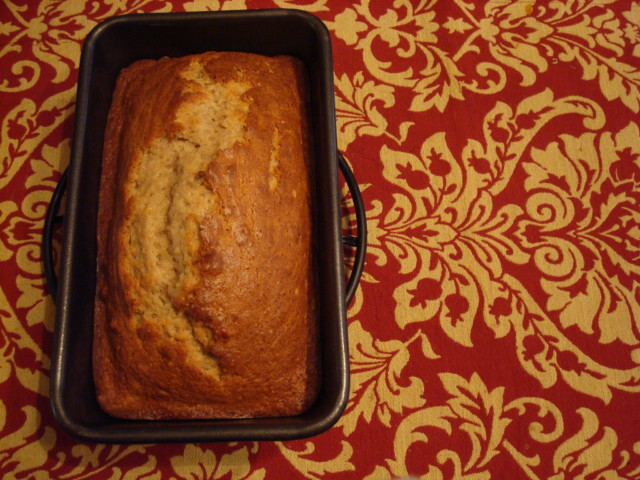 So would it surprise anyone (least of all my husband) when I made banana bread on Sunday morning for breakfast? Preheat oven to 350 degrees. Lightly spray a loaf pan. In a small bowl, mash bananas and mix with honey, oil and vanilla extract. In a medium size bowl, stir together the whole wheat pastry flour, baking soda and salt. Add nuts. Combine the wet ingredients into the dry ingredients. Baker or not, that bread was damn tasty. Maybe I should do this more often? Do you like to bake? Or do you like to cook? I like cooking and baking but I really need to follow a recipe. Especially baking, I get too substitution happy and my food never turns out right. Oh me too! I can’t bake anythign without a recipe but I am cook without a recipe…again that is probably why I don’t like baking. I prefer baking to cooking — maybe because I like the house to smell like cookies or bread? We are total opposites when it comes to bananas — I love ripe bananas, especially when they are covered in brown spots. I like that smell too but find it can easily be acheived with a candle! haha! I’d definitely say I like to bake more than cook – though I do really enjoy both. And also? I really want a slice of that bread! I’m with ya on the crispy fruit – I prefer the crunch too. I like to bake, but I rarely do it. The hubby doesn’t eat sweats, and I don’t need to eat an entire pan of cookies/muffins/quick bread/etc. Yours looks really good though. I wish I had a slice to eat with my green tea right now! In THEORY I like cooking/baking. In REALITY I don’t have time! Or maybe I’m not organized enough to be prepared? Either way, it is a struggle in our house. 🙂 Although I do start my cake decorating class this week!!! Yay! You should do it more… if you have the opportunity to try this again add some chocolate – there’s a recipe for this on my blog – it works incredibly well with really dark chocolate. I don’t mind cooking (especially when it’s something I’m jazzed about) – but baking has my heart. That bread looks fantastic. Also, I would – without question – rather starve than eat a mushy banana. Blech. Um…yeah if I didn’t have a dishwasher I would use paper plates and plastic silverware for every meal. Sorry environment…. I feel the same way about bananas! In fact, I prefer not to eat them even if they have only a few brown spots on them…I like them when they’re still a little green! Hahaha! I love that we are the SAME with bananas- I like them green too. yum! I hate when I get off my game with bananas, I also hate mushy ones. I’m all about when they just turn yellow/still have a bit of green! And bananas are so tempremental…like one day there are perfect and then the next day they’re completely brown. I like to bake and cook just sometimes, if that makes sense. I am not particularly passionate about either unless it’s a super simple recipe with few ingredients. I enjoy the eating part MUCH better! Honestly? I am not passionate about either one either. I cook to eat but I don’t feel like I am in my element in the kitchen. It isn’t something I have to do and if eating out every day wasn’t so expensive then I would totally do that!! I enjoy both cooking and baking, but I like baking a little bit better! It’s more fun to make sweets! I have such a sweet tooth!